What is it? The Amsterdam Produce Summit is a one-day conference and expo that will bring the international fresh produce community together in The Netherlands to discuss the role that the produce supply chain will play in the omni-channel future. What happens? The Amsterdam Produce Summit reflects the concept of “a meeting at the topmost level” in one of the most innovative cities in the world. This will be a unique event where we gather thought- and practice-leaders from around the globe, from across the supply chain, and have a high-level forum in which the future of the industry is defined. What are the dates? The dates of this year’s summit will be November 12-14, 2018. The night of November 12 is a special dinner for our speakers and overseas guests – with dinner sponsors gaining VIP access. November 13 will be the main day of the conference and expo, and November 14 will be high-level industry tours to Amsterdam's most progressive produce retailers and to the European headquarters of Robinson Fresh/CH Robinson. November 12, 2018 - Networking Dinner for Speakers. Venue TBC. November 14, 2018 - Retail & Industry Tours in Amsterdam. Who exhibits? There is space for up to 18 major fresh produce companies, importers & distributors and supermarket retailers in an intimate expo, which takes place during the conference networking breaks on November 13, 2018. How does registration work? Register below by October 1 and qualify for the early-bird registration fee of EUR199 per person. Rates are available for groups of more than three from the same company. All registrations after October 1, 2018 are at the full fee of EUR299 per person. Who organises the APS? 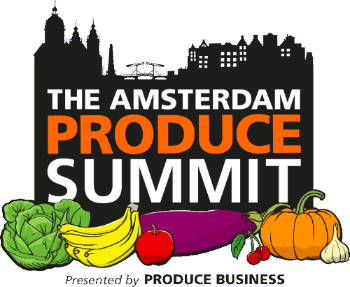 The Amsterdam Produce Summit is organised and hosted by the creators of the award-winning New York Produce Show and Conference and London Produce Show and Conference.